FME Hub has new features that enable you to start using new FME components more quickly, contribute content, and more. Make it easier to manage FME Hub content as part of a team. A publisher allows you to collaborate and manage FME Hub items you own as a team. Prior to publishers, items on FME Hub could only be uploaded directly under a user. For larger teams that meant sharing one login, which made it hard to manage large amounts of content. This user is part of two publishers (owner of one, a contributor on the other). 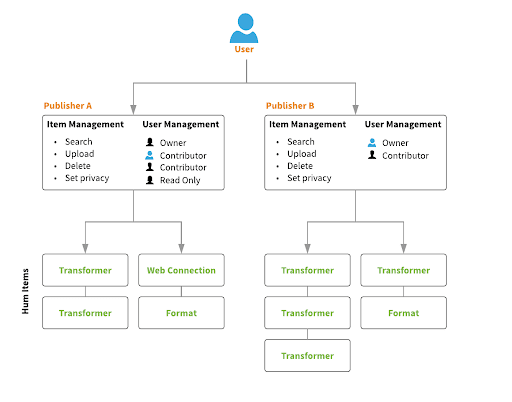 Organization – You can create as many publishers as you want, which allows you to separate items depending on their function. As part of each publisher, you also get a management dashboard, which makes it easier to manage your items. Collaboration – You can invite multiple team members to collaborate on a publisher. Increase your exposure to the community – Each publisher comes with its own public page where you can set a logo, enter a description, and enter various details so you can identify yourself to the community. Creating our official Safe Software publisher. To give you an idea as to how publishers can be used, here is how we plan on using them at Safe Software. Prior to publishers, we had over 250 items on the FME Hub, with a team of 15+ all contributing under one user. We have decided to create three different publishers to help us manage our content going forward. We have used publishers to segment different content quality. A different set of people is also responsible for each publisher. Safe Software Official – Managed by our developers. This contains production-quality items that are the same standard as items shipped with the product. Safe Software Lab – Managed by the Experts team. This contains high-quality items that have some maintenance guarantees. 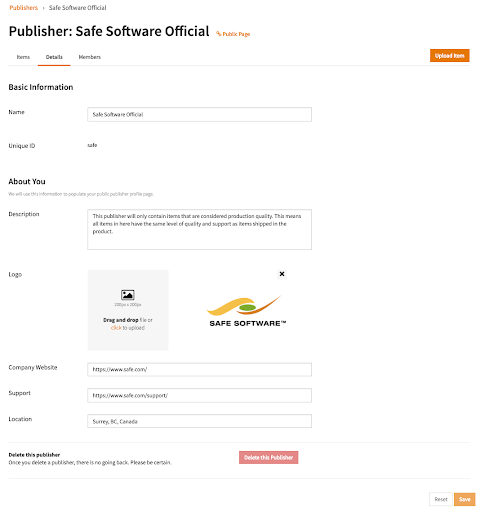 Safe Software Sandbox – Anyone at Safe Software can upload fun items under this publisher that have no maintenance guarantees. You can read more about publishers here. Watch the video below for a tutorial on how to migrate items from your user to a publisher. Delivering FME components to you quicker. FME Packages provide a new way for us to distribute transformers, readers/writers, and web connections. We can group multiple components together into one portable zip archive file with all required dependencies. FME Packages support items created in FME Workbench (i.e. custom transformers and custom formats), but more importantly, they support code backed transformers and readers/writers. This means production-quality items can be created and shared as a single zip (fpkg) file. We have also added support for FME Packages to FME Hub. In FME 2019, Safe Software will begin placing transformers and formats that would have previously been shipped in FME Desktop on FME Hub. 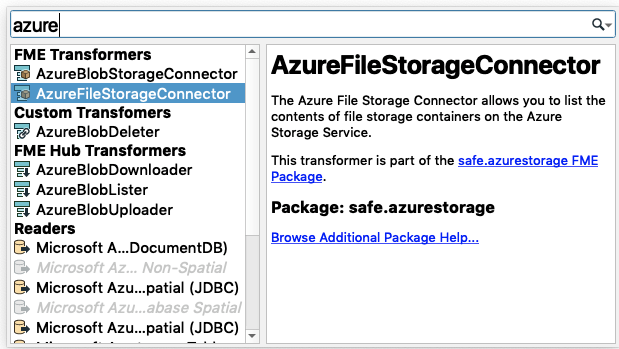 The Azure Storage FME Package is a great example of this. Two things really excite me when we pair FME Packages with FME Hub. Agility – Get fixes and new features into your hands within hours, not months. By placing items on the FME Hub as an FME Package—rather than shipping them with FME Desktop—we decouple these items from the annual FME release cycle. This means if a critical bug is identified (i.e. an API is deprecated), Safe Software can immediately respond and push the fix to you via FME Hub. It will also reduce our time to market for new features, allowing us to push out features when they are completed, rather than waiting for the annual release. Community Engagement – A developer platform for our active community. For 2019, only Safe Software will be able to create FME Packages and host them on FME Hub. However, longer-term we will open this up, and FME Packages will make it much easier for customers and partners to both create and share production quality code backed plugins. Watch this space. FME Package support has been added to FME Workbench 2019.0. Since FME Packages will only be used to distribute official Safe Software items in the 2019 release, we have treated them a bit differently to community generated FME Hub items. Official FME Packages containing transformers will show up when you use Quick Add in FME Workbench. They will show up under the FME Transformers heading, not the FME Hub heading. They can be differentiated from shipped items as they will have the package icon ( ). Once installed, official transformers will appear as normal blue transformers in FME Workbench. If Safe Software uploads a new version of an FME Package that you are using, you don’t have to upgrade FME Desktop to get the new functionality. You can simply right-click and just update that specific version. In doing so, FME Workbench will download the new FME Package version from FME Hub and automatically update the transformer in FME Workbench. Readers/writers and web connections are also supported. You can read about FME Packages in-depth here. Share FME Server workflows on the FME Hub. FME Server is a powerful piece of software. A few years ago, to make getting started with FME Server easier, we introduced the concept of FME Server Projects. FME Server Projects allow you to package up a set of objects so you can move or share FME Server components rather than the entire server. By adding support for FME Server Projects to FME Hub, this means Safe Software and the wider FME community can start sharing FME Server Projects (including Automations) with each other. Here is an example project that provisions FME Server Engines to run specific jobs during a predefined time period. To install, download it from FME Hub and import it under Projects on your FME Server instance. Keep up to date with new content created by Safe Software and the FME community. You can now sign up for a monthly digest. We’ll send you one email per month that details new items contributed by Safe Software and the FME community. You need to register for FME Hub (same login as your community login) and check the checkbox here. As you can see the role of FME Hub is evolving to not only allow the community to share workflows and components, but also to allow Safe to share production-quality items. We are looking forward to seeing all of the great content that gets uploaded.